Did you want to know learn more about wineries, vineyards, and the Charlottesville real estate market? Let’s cover some basics to get the proverbial ball rolling. Wine is an alcoholic beverage derived from the fermentation of grape juice. Winemaking, which is also known as vinification, is a production process that begins with the selection of grapes and other produce and ends with bottling the finished product. A vineyard is a plantation that grows vines that yield grapes used for winemaking. A winery is an establishment where harvested grapes are segregated, cleaned, and processed. Wineries are facilities that also perform the winemaking steps of fermentation, aging wines in wooden barrels, bottling and labeling. Viticulture involves the practice and study of winemaking in Virginia. An appellation is a legally defined geographical indication that identifies where winemaking grapes are grown. Terroir is a set of factors such as geography, geology, and climate that gives a wine its distinctive character. Now that we’ve covered some elementary terms, lets focus on considerations when looking for wineries and vineyards for sale in Charlottesville/Virginia. Purchasing a winemaking estate can be a complicated and expensive ordeal. Buyers need to know the right questions to ask and be able to truly understand the selling party’s answers. 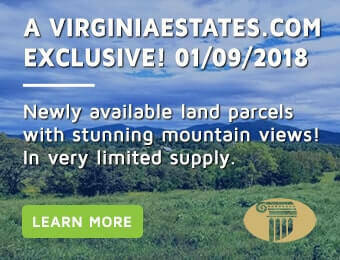 Virginia Estates offers expert advice that can help you navigate every stage of this type of specialized real estate process. We encourage you to contact us today at (434) 296-1234 if you are looking to buy or sell a vineyard/winery in Charlottesville or the surrounding countryside. Here are some helpful pointers worth consideration. Request information from a winery/vineyard owner that details specific planting information and rights, including precise land information, appellation, grape variety, planting date/schedule, and grapevine planting density for each land parcel. Learn more about the soil and subsoil (terroir) of the vineyard, winery, or land parcel to gain a better handle on what type of elemental characteristics will influence the attributes of the finished product. Pay close attention to the roles of drainage and landscaping, and how they may have altered the structure of the soil. Since grapevines are susceptible to a number of diseases, consult with a viticulturist or other qualified expert such to make certain existing grapevines and rootstocks are healthy. When it comes to buildings, request recent reports from the owners that detail information on energy efficiency, asbestos, lead, and termites. Have all buildings inspected by a qualified inspector or homebuilder. Obtain as much information as possible; contact the local county or mayor’s office to gather information on zoning, public works, and proposed land developments in the surrounding community. Make certain the property is not in a designated flood zone or in an area that is highly susceptible to natural disasters. Obtain a detailed list of all winemaking that is for sale, and request specific information regarding ownership, the age of the equipment, and corresponding maintenance schedules. Play close attention as to how the current owner(s) treat wastewater and make certain existing systems and procedures conform to current laws. This is extremely important because contamination related to wastewater treatment and chlorine can negatively impact vinification. Examine the condition of vats, electrical systems, and temperature control systems. Review any existing product/corporate trademarks that are affiliated with the purchase with an intellectual property (IP) attorney. Now that we’ve covered some high-level considerations you need to make when looking Virginia/Charlottesville wineries/vineyards, lets take a look at a few of your future staffing needs. If you are purchasing an operational vineyard or winery, you make be taking on existing staffing obligations. It may make sense to retain existing staff assuming they best understand the land, buildings, and winemaking equipment. If you are starting from scratch and are not a viticulturist, find a qualified expert who can recommend and/or oversee planting, related agricultural pursuits, and business needs. Thanks again for visiting our website. Contact us today if you need further assistance with vineyard/winery real estate needs.